A recent beautiful product of the banana breeding program in Honduras, this cultivar has commercial potential. This is the improved "Williams" type. It has a high wind resistance, some cold tolerance, and excellent disease resistance with s strong pseudostem and base. 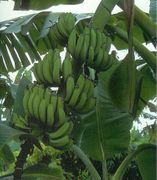 It is an outstanding producer of delicious tasting bananas. The plant is solid green with no red color but due to the majesty of its size is a good landscaping plant. 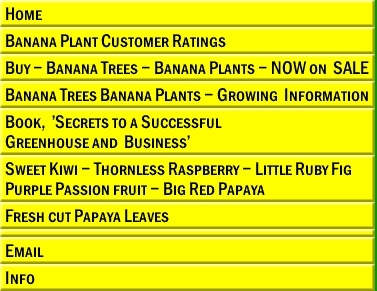 Nice bunches of fruit which are extremely sweet and tasty and is an outstanding producer of delicious tasting bananas having a sweet Lemony flavor. Hardiness Zone 7-11 can get Max. Height: 10' Can grow up to 2' per month. Beautiful plants 12" tall shipped.